In Tanzania’s Tarangire National Park, it’s the Monkeys you have to watch out for. Sure, there’s a poisonous green Boomslang perfectly poised to strike in a tree by the restroom. There are massive piles of dung strewn about, suggesting that Elephants could stroll through at any minute. And the golden grass that surrounds the picnic area is tall enough that a hungry Lioness could jump out while you’re taking pictures of the colorful Splendid Starlings flitting in and out of thorn-laden Acacia trees. 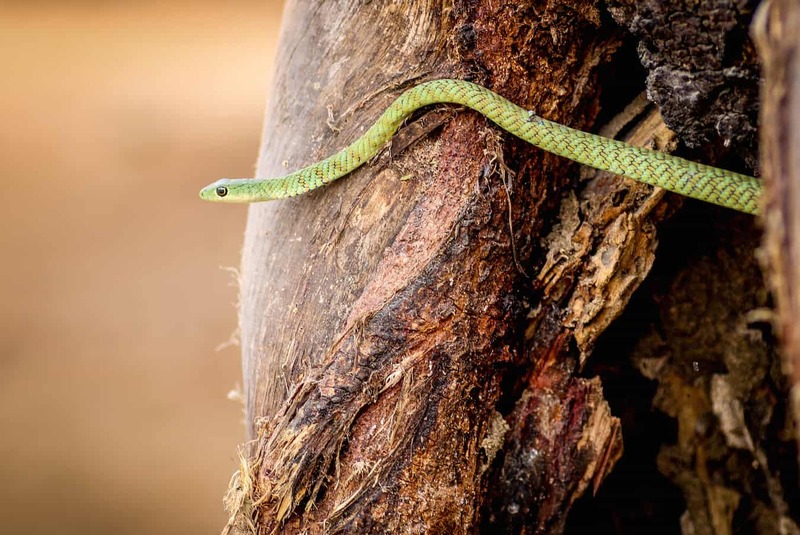 The Highly Venomous Boomslang, Which Lays Its Eggs in Hollow TreesBut the monkeys? They’re pure trouble waiting to happen. This point is illustrated less than 15 minutes into our arrival at Tarangire, as travelers tuck into their lunch boxes while our respective guides register with the National Park staff. The German couple at the next table is distracted by an adorable family of Banded Mongooses searching for insects in the underbrush across the road. She’s taking pictures while he watches. He moves less than 3 feet from their table, turning his back for a mere moment. 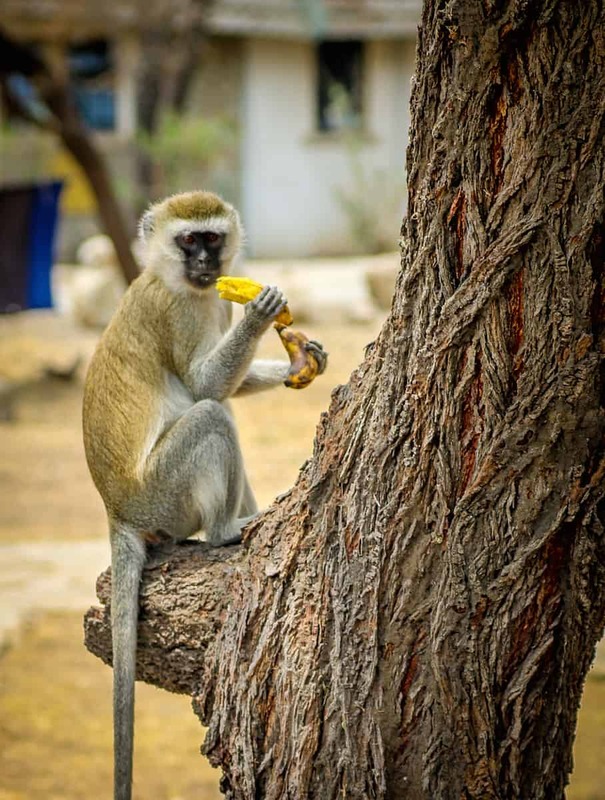 It’s enough time for an opportunistic Vervet Monkey to streak like a blaze, leap atop their table, grab the tantalizing banana left sitting unattended and make his way to the other side of the picnic area before the hapless tourist even realizes what’s happened. 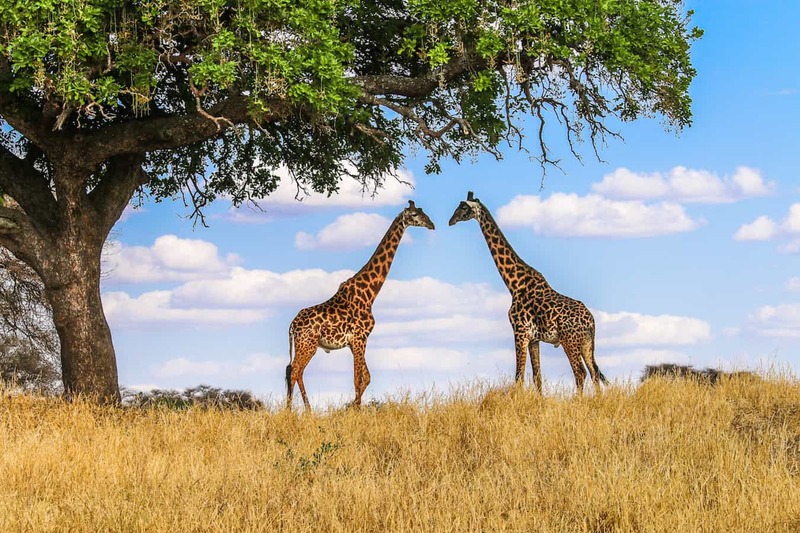 Located near Lake Manyara, about a 75-mile drive southwest of Arusha, Tarangire is Tanzania’s sixth-largest national park at 1,100 square miles. 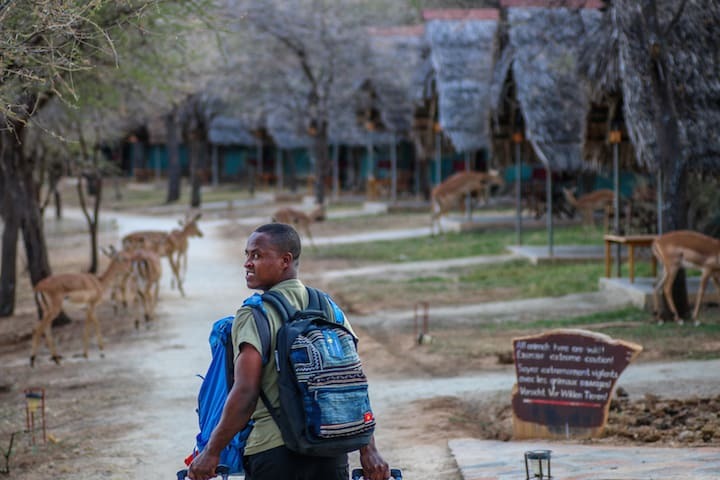 Established in 1970, it’s not nearly as world-renowned as some of the other parks on the country’s northern safari circuit (including Serengeti National Park and the Ngorongoro Conservation Area). As such, it has far fewer visitors than those “Bucket List” safari destinations, even at the height of peak season (which lasts from July through October). The park is named after the Tarangire River, which passes through it and makes visiting Tarangire a seasonal boom-or-bust proposition. During the rainy season the majority of the wildlife migrates out of the park, across the Rift Valley and to the grazing grounds of the Masai steppe. But during the dry season, when the vast herds of the Serengeti make their Great Migration north to Kenya, the Tarangire River serves as a rare, reliable water source, drawing an immense concentration of animals. The myriad species found there are as diverse as the stunning landscape, which varies from verdant hills dotted with Baobab and Acacia trees to dense bush and high grasses. Featured in National Geographic Traveler‘s 2015 Africa Collection, the family-0wned Tarangire Safari Lodge proved to be an incredible home base for our first safari adventure. 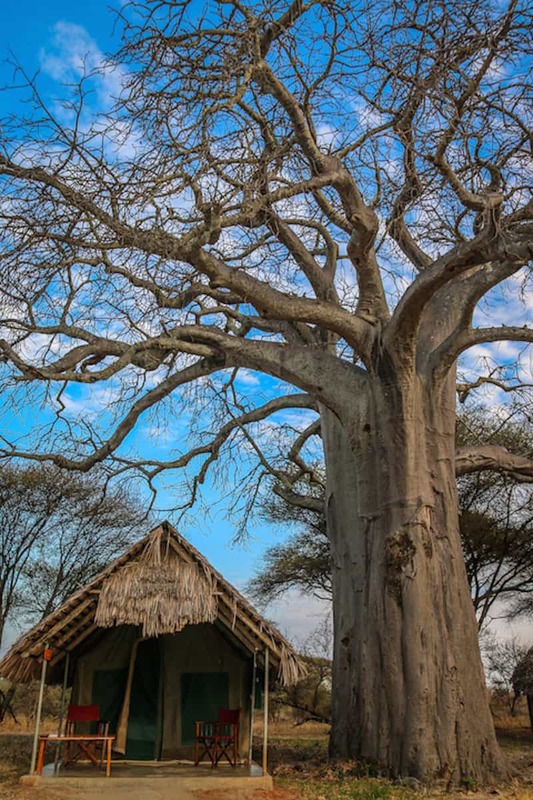 It’s a luxury tented camp, which means there are thatched roofs, King-sized beds and mesh-screened windows. There’s also solar-powered electricity available from 6-10 AM and 6-11 PM (i.e. 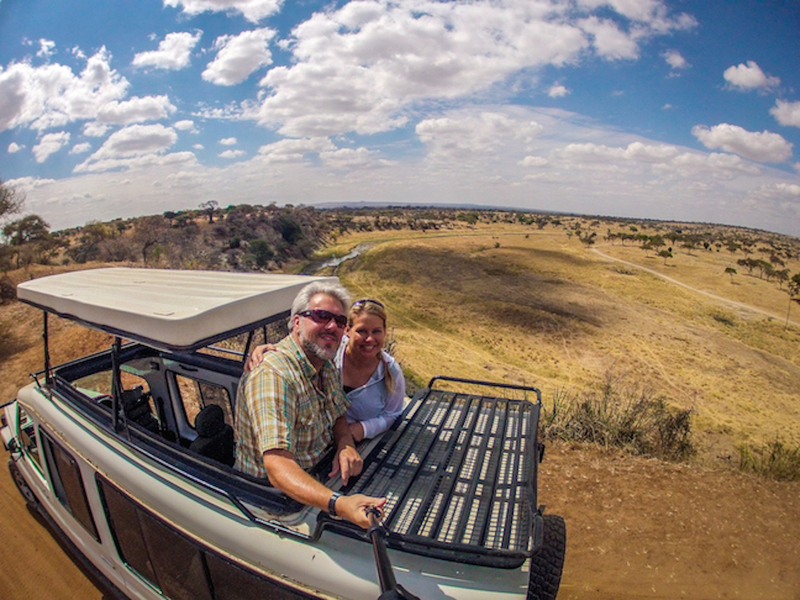 anytime we weren’t on game drives); en-suite bathrooms with solar-heated showers; and verandahs providing exceptional views of the breathtaking scenery that surrounds us. 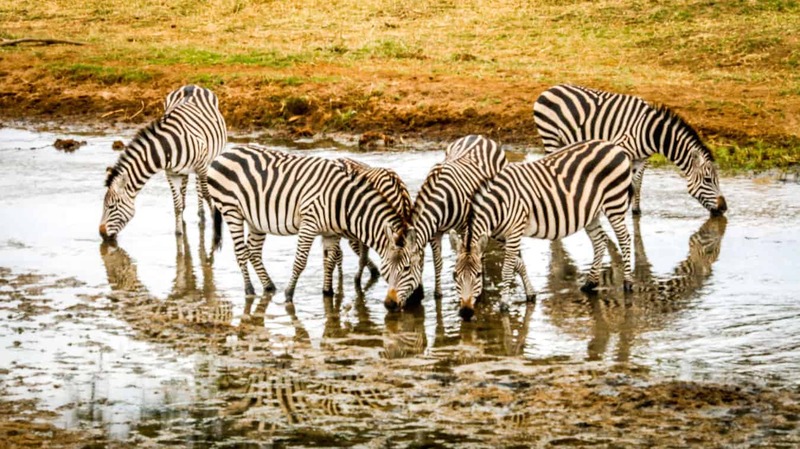 You don’t even need to go on game drives to see wildlife here: The lodge grounds are filled with huge herds of Wildebeests and Zebras and families of Baboons and Warthogs. On the short 100-yard walk to our tent when we checked in, we saw nervous Impalas, opportunistic Vervet Monkeys, sleeping Straw-Colored Fruit Bats and a juvenile Verreaux’s Eagle Owl. The evening Sundowner on their fire-lit terrace became our favorite nightly tradition, providing stunning sunset views of the savannah surrounding the Tarangire River. 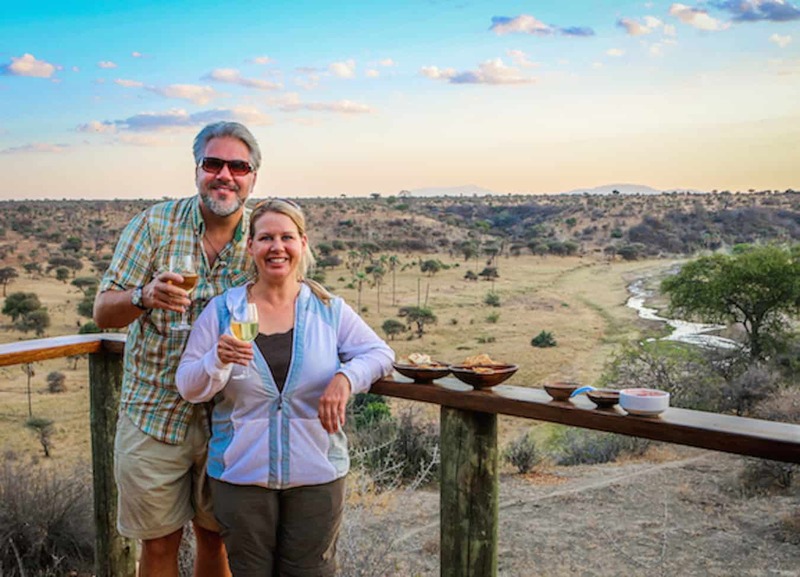 While we sipped our white wine and snacked on beet-root chips and popcorn, we watched Elephant herds shuffling along the riverbank and tiny Dik-Diks grazing less than 10 feet from us as the cackling sound of Hyenas echoed through the night. A Private Sundowner at Tarangire Safari LodgeIn the mornings we rose with the sun, emerging from our tent, bleary-eyed, to watch it rise over the horizon. Thankfully the lodge offers an extensive breakfast buffet, with strong coffee grown just a few hours away on Mount Kilimanjaro. We would need that rocket fuel as we rendezvoused with our excellent guide/driver, Rama Mmasa, and began mind-blowing game drives that lasted up to 10 hours. 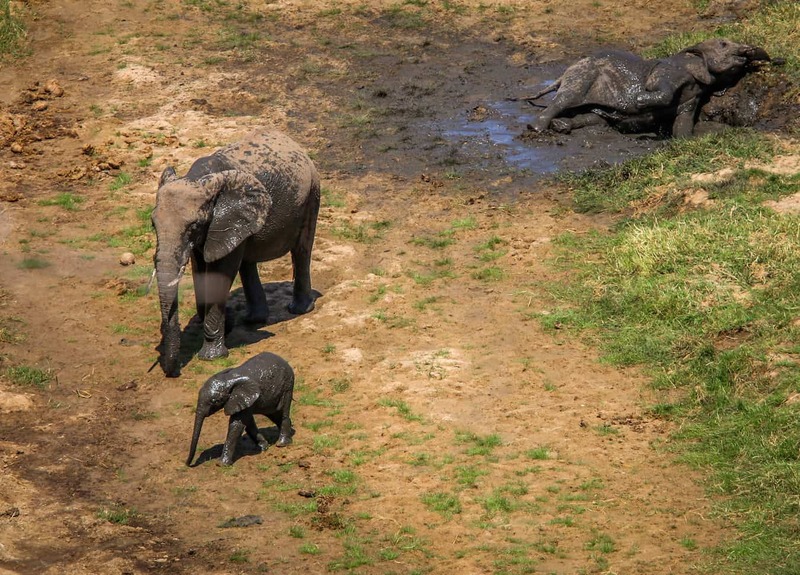 Central Africa has a SERIOUS Elephant poaching problem. The stats are staggering: Around 100,000 Elephants were killed for their ivory tusks (largely to satisfy the booming market in China and Southeast Asia) in just three years, with around 1 in 12 animals killed in 2011 alone and a 64% population decline over the past decade. 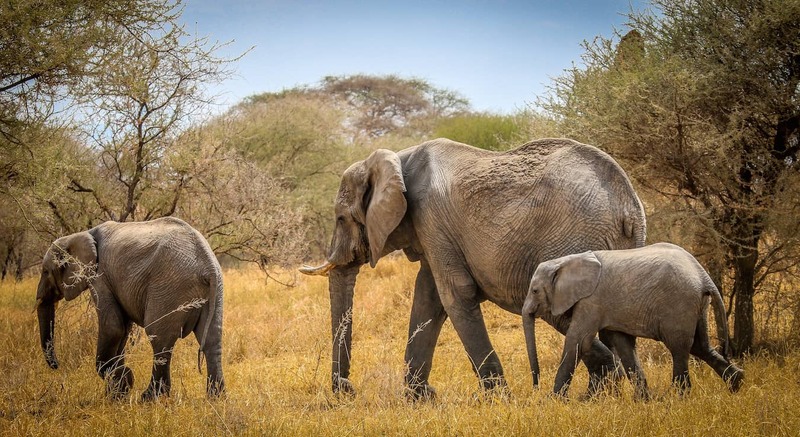 There was a recent statement made by Minister of Natural Resources & Tourism Lazaro Nyalandu, suggesting that the worst of Tanzania’s Elephant poaching crisis was over. And yet the East African nation has proven to be the primary source of illegal ivory from savanna Elephants for nearly a decade now. In the last five years alone, the country’s population has dropped by 60%, to around 43,000. 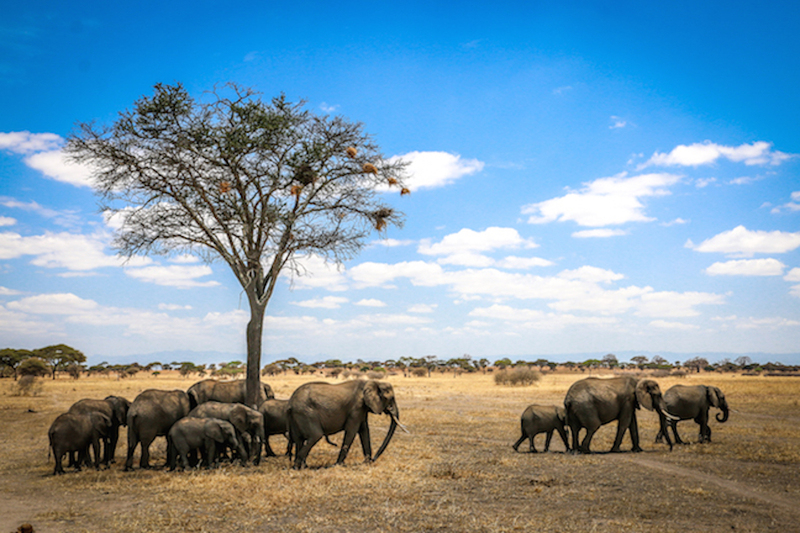 With a peak season population of 3000+ Elephants, Tarangire National Park is home to nearly 10% of the country’s entire population. The park boasts an impressive average of around 3 Elephants per square mile. In fact, we saw so many Elephant herds during our two days in the park, it almost seemed difficult to imagine that these beautiful creatures could be endanger of extinction during our lifetime. 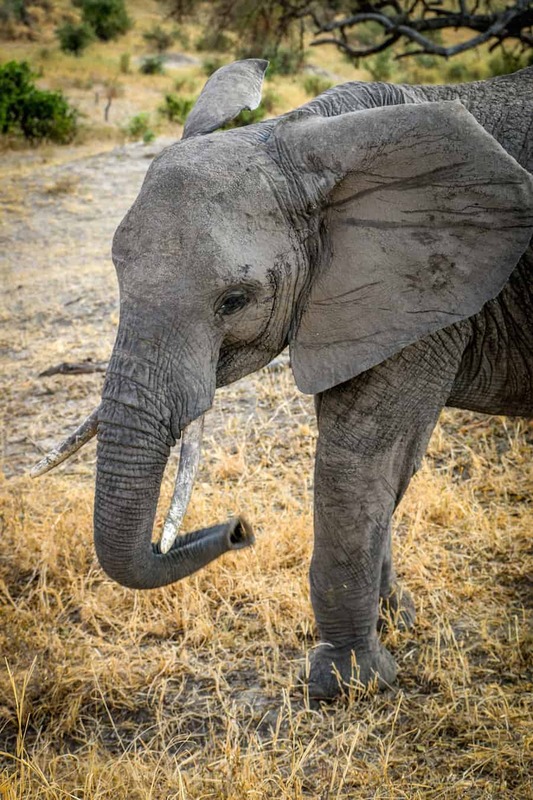 Our memorable Elephant sightings began within minutes of our entrance to Tarangire, and didn’t let up during our 48 hours in the park (in which we explored more than 50% of its total area). There was a big mama knocking down branches of an Acacia tree so her young ones could nibble on the freshest leaves. There was an adolescent right by the road, who seemed unconcerned that our vehicle was within 10-15 feet. And then there was the large family that gathered around its babies in fierce protection until they realized we were no threat, then proceeded to march in formation across the savannah. From our room at Tarangire Safari Lodge we watched a herd of several dozen Elephants grazing along the river, occasionally stopping to wallow in a mud pit that protected them from bugs and sun. On our last day we saw what we thought was a dead (or dying) baby Elephant with its family crowded around him mournfully. We literally cheered with joy as we realized it was just taking a nap in the blazing midday sun while waiting for the massive matriarch to catch up. Given our mutual love for Elephants, our work raising funds for Thailand’s Elephant Nature Park and my life-changing experience with an Elephant I saw on my first safari in South Africa 15 years ago, it was incredibly uplifting to see so many of these incredible animals in Tarangire. While there is undoubtedly much conservation work left to be done, the sight of countless adorable babies and curious adolescents gave us hope that the battle to save this iconic species may still be won. 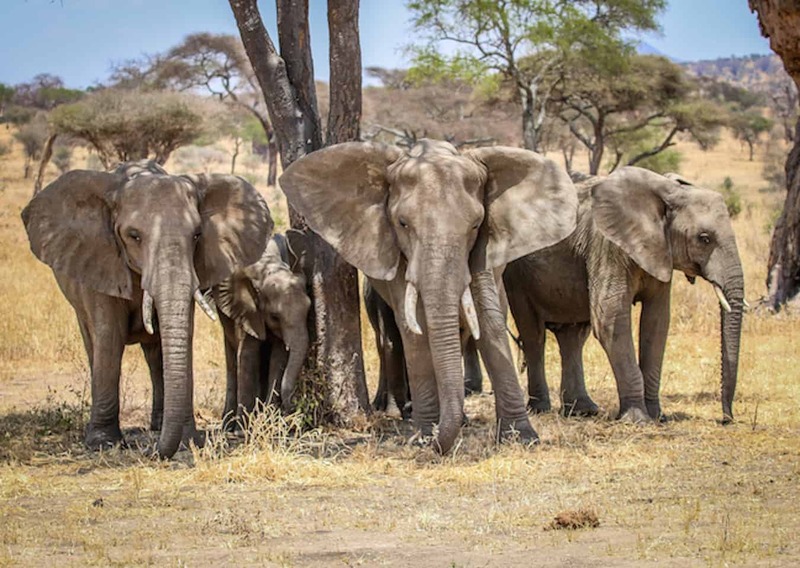 While the Elephants are arguably Tarangire’s main animal attraction, they’re far from the only one. The brilliant blue sky, dusty red earth and brittle yellow grass provided a spectacular scenic backdrop for myriad species big and small, ranging from the tiny Rock Hyrax (a.k.a. Rock Badger) and Dwarf Mongooses to the famed Big 5. 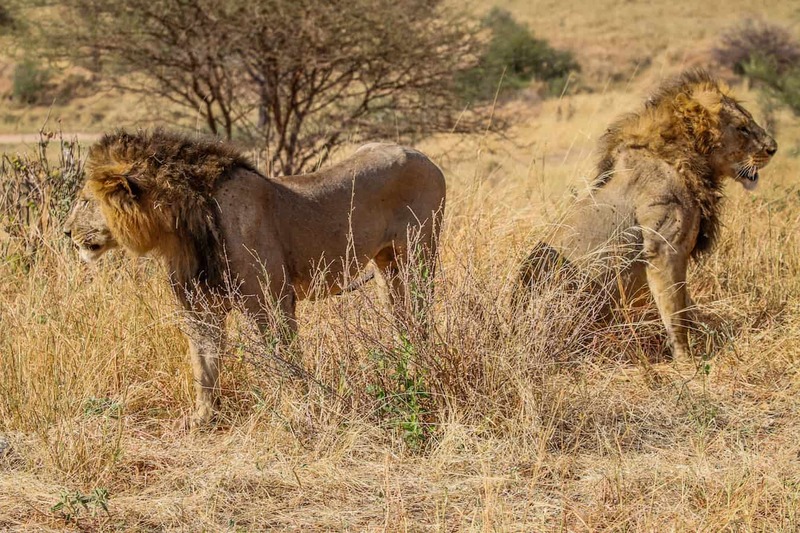 Though not as frequently sighted in Tarangire as they were in Serengeti National Park, we saw Big Cats fairly regularly. We watched the two males pictured above for nearly an hour as they graciously posed right beside the road. Things got exciting the next day when a hobbled Zebra walked within 50 yards of a mother lion and her year-old cub relaxing under a Baobab tree. Fortunately for the Zebra, the duo seemed well-fed, ultimately proving more interested in napping than hunting. 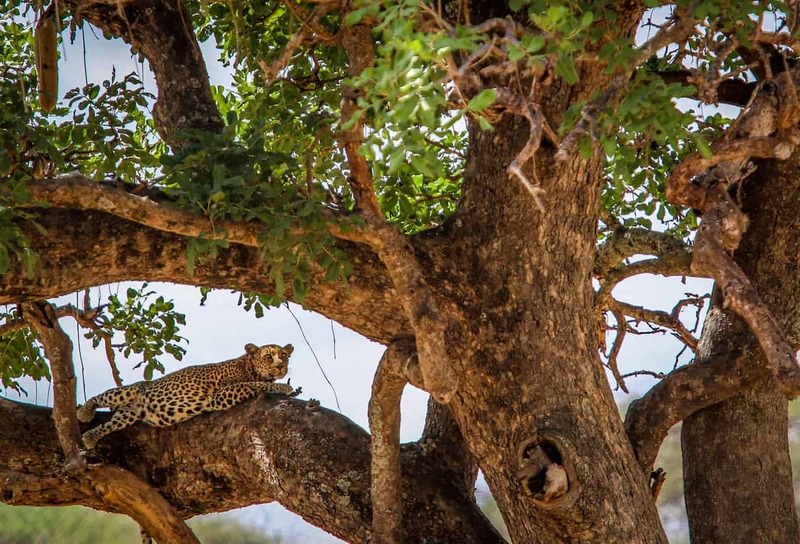 We spotted an average of one to two Leopards each day, usually resting on branches hidden in the shade of giant Sausage Trees. Finding them proved a difficult challenge, but getting the lazy Leopards to raise their heads so we could get a decent picture was damn near impossible. The shot you see above took us over an hour! The Rusty-Spotted Genet (a.k.a. Panther Genet) outside our Safari Lodge tent was much easier to see, but much too quick to photograph as it scurried off into the night. Herds of Cape Buffalo, Eland, Gazelle, Impala, Hartebeest and Zebra were a frequent sight, particularly around the shrinking watering holes. Dry-country antelopes, such as the Fringe-Eared Oryx and Long-Necked Gerenuk, were more rarely spotted. Giraffes, in family groups ranging from 4 to 16+ members, could often be seen making their way down to the river to drink, bending down awkwardly like supermodels who had not yet discovered their catwalk strut. 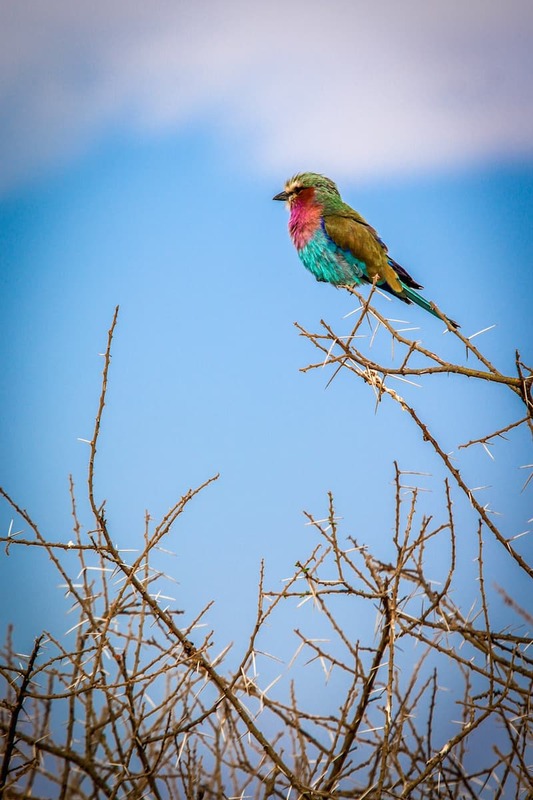 If you’re not an avid birdwatcher before visiting Tarangire National Park, prepare to be converted. There are more than 550 colorful bird species here (many of which we’d never seen anywhere else), including the ubiquitous Red-Billed Hornbill, Lilac Breasted Rollers, Yellow-Collared Lovebirds, White-Headed Buffalo Weavers, Egyptian Geese, Secretary Birds, Kori Bustards (the world’s heaviest flying birds) and the bizarre Stocking-Thighed Ostrich, whose males get vivid pink legs during the mating season. Looking back on our time in Tarangire, I can’t recall more than a few minutes that went by without us stopping for some sort of photo-worthy sighting. There were myriad different ecosystems (who knew there were African plains with enough palm trees to rival Florida?! ), and a higher concentration of wildlife than we saw in any of the 9 different national parks and conservation areas we visited during our 3 weeks in Tanzania and Rwanda. 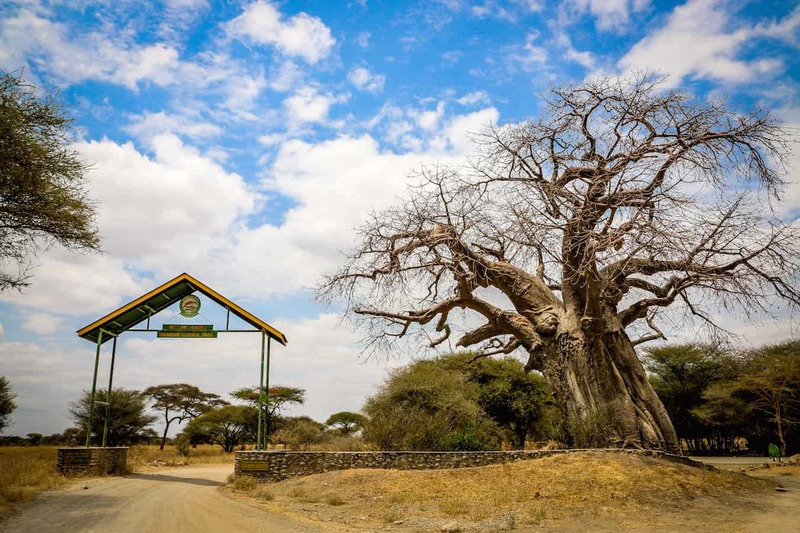 In short, Tarangire National Park was precisely the sort of off-the-beaten path ecotourism gem we’re always looking for. For most of the two days we spent inside the park, there wasn’t another car in sight, which helped make this our favorite safari experience in Tanzania. We are open to discussing advertising, sponsorships, brand ambassadorships, freelance work, speaking/teaching engagements, and consulting opportunities. 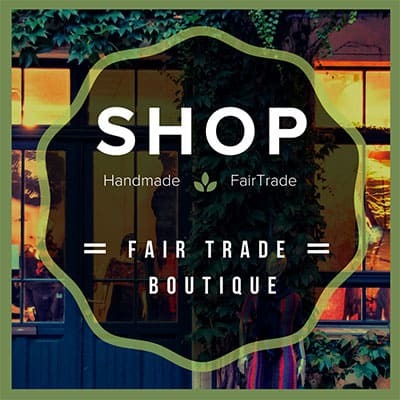 Please contact us at i[email protected] for more info.